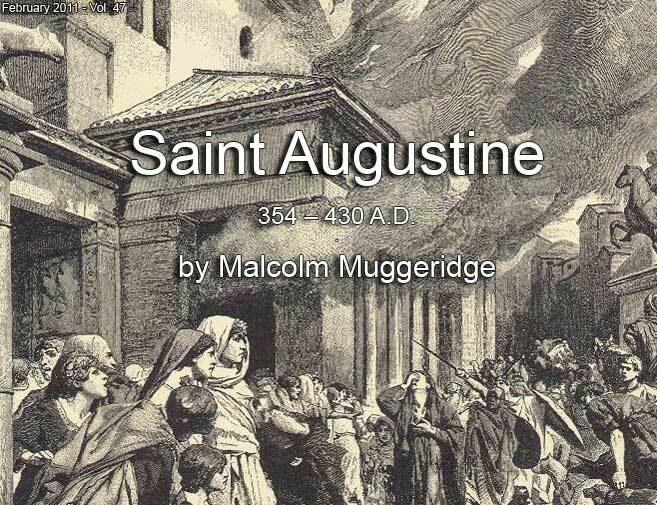 When at the beginning of the fifth century A.D. Rome was sacked, Augustine was at the height of his fame as the Bishop of Hippo in North Africa. Confronted with the dissolution of the Roman Empire, like a latter-day Noah, he was constrained to construct an ark, in his case Orthodoxy, wherein his Church could survive through the dark days that lay ahead. Thanks largely to Augustine, the light of the New Testament did not go out with Rome’s but remained amidst the debris of the fallen empire to light the way to another civilization, Christendom, whose legatees we are. It was as though he had been specially groomed for the task. Tempered in the fires of his own sensuality, toughened by his arduous explorations of the heresies of the age, he was a master of words written and spoken, which he offered in God’s service, first asking that God would give him the wherewithal to offer. In Augustine’s eyes Rome stood at the very pinnacle of history. He saw it as the secular state carried to the highest degree of perfection, providing the only tolerable framework of life for mankind. Its disappearance from the human scene, if so unthinkable a catastrophe were to happen, would leave behind not other, alternative civilizations, but a vacuum, a darkness. Augustine’s own North Africa partook of this glory. The city of Carthage was a little Rome. The abundant harvests, the flourishing cities and ports, the entertainments and spectacles, all signified participation in the Roman Empire, which to Augustine was the whole world. Augustine was born in the year 354, some forty years after Christianity had become the acknowledged religion of the Roman Empire under Constantine. His birthplace was in a hilly district of North Africa, the Roman province then known as Numidia, in one of the many small towns which were scattered about what was then a rich and luxuriant countryside. His father, Patricius, belonged to the middle classes and was reasonably well off except that he was a victim of the very excessive taxation which characterized those troubled years. He was a wealthy man who remained a pagan till the end of his life, when he was belatedly baptized a Christian. Augustine’s mother Monica, on the other hand, was a Christian of tremendous piety. Without any question, her devotions and meditations were conducive to Augustine not fulfilling his father’s purpose and becoming a successful lawyer or civil servant, but, as she hoped, dedicating his life to the service of Christ and the Church. She made him a saint and his sanctity resulted, in due course, in her being canonized. His studies went easily. He excelled and quite soon became a teacher of rhetoric –a rather empty and pretentious discipline which in those days was very highly regarded, rather as sociology is today. Looking back on his profession, he contemptuously called it being a vendor of words. Alas, my own trade! By the end of the fourth century the decadence which had afflicted Rome had spread to the northern African provinces, especially to the great port and metropolis of Carthage, at whose university Augustine studied and later taught. Thence he transferred to Rome because he said he found the Carthage students too turbulent – a very contemporary touch. To a provincial like young Augustine, the Mediterranean would have seemed like the gateway to the larger world of Rome. After all, he was a very ambitious man, and in his time, as in ours, eminence as a man of letters or as an academic could lead to positions of great power and responsibility. Also, I think, he wanted to escape from the watchful eye of his mother, Monica, and indulge freely in what Pascal would later call “licking the earth,” and Augustine himself, after his conversion, would describe as “scratching the itching sore of lust.” So, to avoid the pain and embarrassment of saying goodbye to his mother, one night he slipped away across the sea, taking with him his mistress and their son, Adeodatus. It was on any showing a very unkind thing to do and afterwards his contrition for it was great. In Rome he easily consorted with some of the most famous figures of the time, and was appointed to the Chair of Rhetoric in Milan. The appointment brought him into contact with the Imperial Court, and – even more important, from the point of view of his subsequent career – with the famous and saintly Bishop Ambrose. So, at the age of thirty, he had reached the summit of a career with a dazzling prospect before him. But somehow, he remained totally unsatisfied. He called his university appointment his “chair of lies,” knowing in his heart that God had some other purpose for him and that, try as he might, he would never be able to escape his true calling. Roman games and theatre were given over to wildly expensive spectacles of violence and eroticism, like films and, increasingly, television today. To judge by the way that after his conversion Augustine never lost an opportunity of thundering against such spectacles, it is reason- able to assume that he was by no means immune to their appeal. There is also the touching story in Augustine’s autobiography, the Confessions, of a friend who, with great effort, had managed to break an addiction to the games, was tricked into going to them, ventured to open just one eye, and was hooked again. The pagan temples still functioned, but few attended or heeded them. The Christian churches, now under state patronage, were not strong enough to counteract, or even always to resist, the prevailing atmosphere of luxury, violence and self-indulgence. With his sensual disposition and inquiring mind, Augustine was little disposed to hold aloof, though a certain intellectual and physical fastidiousness prevented him from succumbing wholly to a way of life which would assuredly have destroyed him. We know what it is like. We also know that to a temperament as sensual and imaginative as Augustine’s, sexual indulgence makes the greatest appeal precisely because it offers a kind of fraudulent ecstasy – joys that expire when the neon lights go out. “There’s nothing so powerful,” he said when he was a Bishop, “in drawing the spirit of man downwards as the caresses of a woman.” He was speaking from experience and I, for what it’s worth, endorse his opinion. Augustine’s Confessions is really the first autobiography, in the modern sense of the term. For that reason we know more about him than about any other figure in antiquity. Of course, it is not just an account of his life, it is also an account of his quest for truth. So the culminating point in it, from his point of view at any rate, is his conversion. He naturally thought, as did Saint Paul, that this conversion happened at a particular moment, but actually it was the result of a long process which had begun even before he was aware of it. Knowing his nature, Monica had hurried after her son to Milan to watch over him, and pray for his soul’s redemption. Moreover, some of the friends he had made among the amusing, the cultivated and the well-born turned out to be Christians, a fact which came as something of a surprise to Augustine, who in North Africa had associated Christianity with the poor and the lowly. In Milan a great Roman administrator, like Ambrose, might renounce his career to become a bishop, and rich heiresses dispose of all their property to the Church. It was under Ambrose’s influence that Augustine began to study the scriptures, noting particularly the spiritual meaning of Old Testament stories, which had formerly made little impression on him. This played an important part in his final deliverance from the heresy of Manicheism and his ultimate conversion. My misery was complete and I remember how one day You made me realize how utterly wretched I was. I was preparing a speech in praise of the Emperor, intending that it should include a great many lies which would certainly be applauded by an audience who knew well enough how far from the truth they were. I was greatly preoccupied by this task, my mind was feverishly busy with its harassing problems. As I walked along one of the streets of Milan, I noticed a poor beggar who must, I suppose, have had his fill of food and drink, since he was laughing and joking. Will I never cease setting my heart on shadows and following a lie? His anguish and contrition are all too actual to me after more than forty years in the same sort of profession. No one must suppose that this great conversion which had befallen Augustine, this light which had shone into his life and would never again leave it, had turned him away from this world. On the contrary, it made him more conscious then ever before of its joys and beauties, more aware than ever before of the terrific privilege it was to be allowed to exist in time. There is a passage that I love in the Confessions in which he asks “the earth itself, the winds that blow, and the whole air, and all that lives in it…‘What is my God?’” Likewise he asks the sky, the moon and the stars: “What is my God?” None of these was God, he was told. He went on to speak to “all the things that are about me, all that can be admitted by the door of the senses.” They, too, he was told, were not God. Then at last he understood: their beauty was all the answer they could give, and the only answer he needed to hear. Following his conversion, Augustine set out with Monica to return to North Africa, resolving to dedicate the remaining years of his life wholly to the service of Christ. They reached the port of Ostia and were delayed there, because the Mediterranean was infested with pirates and no boats would put to sea. How different was the Augustine who returned to North Africa from the one who had left for Rome! Now he was as avid to leave the world as he had been to plunge into it; as ardently in search of obscurity as he had once sought fame. Then they reached out and touched this eternal Wisdom, which like eternity itself is neither in the past nor the future, but just is. Touched it only to return, leaving, Augustine writes, “our spiritual harvest bound to it, to the sound of our own speech, in which each word has a beginning and an end; far, far different from Your Word, our Lord, Who abides in Himself forever, yet never grows old and gives new life to all things.” Whoever has tried to give expression in words with a beginning and an end, to the perspectives and shape of this creation in which we live, cannot fail to feel awed that so great a writer as Augustine should suffer a like predicament. It was after this experience that Monica told Augustine she had nothing left to live for: God had granted her every wish, now that her son was His servant, and spurned such joys as this world had to offer. Nine days later she was dead, and Augustine, leaving her mortal remains in Ostia, returned to North Africa to undertake what would become his great life’s work. This was to be no less a task than to salvage from a world in ruins the Christian faith, in order that it might provide the basis for a new, splendid civilization which would grow great and then in its time, falter and fail as men, forgetting the eternal Wisdom that Monica and Augustine had glimpsed at Ostia, thought to find in their own mortal bodies the joy of living and in their own mortal minds its meaning. In the Confessions, Augustine’s last reference to his mother asks everyone who reads the book to remember “Monica, your servant, and with her, Patricius, her husband, who died before her, by whose bodies I was brought into this life.” Through the centuries Monica has been duly remembered. As for Augustine, the rest of his life was spent in North Africa. He never crossed the sea again. His idea was to gather a few similarly inclined friends round him and share with them a monastic life on his small estate in the hills where he was born. It was not to be. His gifts were too famous and too precious, and the need for leadership in the Church too great for him to be left in peace. As he told his congregation many years later, when he had long been a bishop, he came to Hippo – one of the many small ports along the North African coast – to see a friend whom he hoped to persuade to join him in the monastic life. Because Hippo had a bishop, Augustine went to the cathedral fearing no threat to his own privacy, but was recognized, grabbed, made a priest, and in due course a bishop. Augustine wept when, almost under compulsion, he was first ordained a priest. Probably he would have had difficulty in explaining just what the tears were about, but one of the causes was certainly his lost dream of a life of prayer and meditation away from a troubled world. He was forty-three years old when he first mounted the cathedra as Bishop of Hippo. Thenceforth, he was endlessly involved in the duties and responsibilities of his office and the often bitter controversies of his time. Contemplating Augustines’s achievement one stands amazed. By becoming their bishop, he had in truth become the servant of his congregation – those volatile Christians of North Africa whose feelings he understood so well. Preaching to them often daily, spending his mornings adjudicating their private disputes, being available constantly to any one of them in need of help or counsel, and all the while conducting an enormous correspondence – his administrative burden was very great. Yet he was a man withdrawn from the commotion around him. Despite his great fame and involvement in his troubled times, he was somehow isolated, as though in his own inner sanctity he had achieved the monastic life he so longed for. Gatherings of the North African hierarchy brought Augustine often to the great metropolitan church at Carthage, where he delivered many of his greatest polemics, placing his dazzling gifts unreservedly at the service of his Church. His public utterances and writings are full of arresting, challenging phrases, as fresh and relevant to our ears as to those who first heard them. Though no one has ever been more insistent on the need for purity, equally no one has ever been less of a Puritan in the pejorative sense. Everything in creation delighted Augustine. He spoke to his congregation of the gloriously changing colors of the Mediterranean, which he had so often observed. All created things should be loved, he insisted, because God made them. The sea, the creatures, everything that is, speaks of God. It will not be held against you that you are ignorant against your will, but that you neglect to seek out what it is that makes you ignorant; not that you cannot bring together your wounded limbs, but that you reject Him that would heal them. Again, like his Master, like the Gospels themselves, he used everyday imagery to make his points. As when he compared God’s gifts to us to a man giving his girl a bracelet. We take for granted the slow miracle whereby water in the irrigation of a vineyard becomes wine. It is only when Christ turns water into wine, in quick motion, as it were, that we stand amazed. When all is said and done, is there any more marvellous sight, any occasion when human reason is nearer to some sort of converse with the nature of things, than the sowing of seeds, the planting of cuttings, the transplanting of shrubs, the grafting of slips? It is as though you could question the vital force in each root and bud on what it can do, and what it cannot, and why. So, this scintillating mind lives on in his words. Words which take account of the times in which they were spoken or written and the fears and anxieties these times generated, but which brush aside empty hopes of fashioning a better world out of mere mortal hopes for one. I no longer wished for a better world, because I was thinking of the whole of creation, and in the light of this clearer discernment I have come to see that, though the higher things are better than the lower, the sum of all creation is better than the higher things alone. Augustine was fifty-six years old and in Carthage when, in the year 410, someone came and told him that Rome had been sacked. It must have been a dramatic moment in his life. Of course he knew that something of the kind was liable to happen and had prepared himself and his flock, as far as he could, for it. “Don’t lose heart, brothers,” he told them, “there will be an end to every earthly kingdom, and if this is actually the end now, God sees.” Even so, he continued to nourish the hope, as people do when great disasters loom, that somehow it wouldn’t happen. Augustine’s first duty was to hearten his flock and prevent the panic and demoralization which the flood of refugees already beginning to arrive in North Africa from Rome might well have brought about. In a sermon delivered at the time, he compared the capture of Rome by Alaric, king of the Visigoths, with the destruction of Sodom, reminding his listeners that in the latter, biblical case, everyone had perished and the city had been eradicated by fire, never to exist again. In Rome, there were many survivors, including all who had taken refuge in the churches, Alaric himself being an Arian Christian. There had been a great deal of destruction, of course, but as Augustine pointed out, cities consist of men, not walls. Rome had been chastised but not destroyed. Then he turned to the deeper question of the relations between earthly cities, like Rome, which have their day, rising and falling like everything in time, and the Heavenly City or City of God, which is everlasting. This question occupied him for the next seventeen years, almost to the end of his life, and resulted in his great work of genius, The City of God, which directly or indirectly influenced the thought of Christians on what they owed to God and what to Caesar through the succeeding fifteen centuries. Take Aristotle, put him near to the Rock of Christ, and he fades away into nothingness. Who is Aristotle? When he hears the words, “Christ said,” then he shakes in hell. “Pythagoras said this.” “Plato said that.” Put them near the Rock and compare these arrogant people with Him who was crucified! In our fallen state, our imperfection, we can conceive perfection. Through the Incarnation, the presence of God among us in the lineaments of Man, we have a window in the walls of time which looks out on this Heavenly City. This was Augustine’s profoundest conclusion, and in his great work he enshrined it imperishably, to be a comfort and a light in the dark days that lay ahead, when in the year 430, the triumphant Vandals would cross into Africa, reaching the walls of Hippo itself, as he lay dying there. In its sojourn here, the Heavenly City makes use of the peace provided by the earthly city. In all that relates to the mortal nature of man it preserves and indeed seeks the concordance of human wills. It refers the earthly peace to the heavenly peace, which is truly such peace that it alone can be described as peace, for it is the highest degree of ordered and harmonious fellowship in the enjoyment of God and of another in God. When this stage is reached then there will be life, not life subject to death but life that is clearly…and assuredly life giving. There will be a body, not a body which is animal, weighing down the soul as it decays, but a spiritual body experiencing no need and subordinated in every part to the will. This is the peace that the Heavenly City has while it sojourns here in faith, and in this faith it lives a life of righteousness. To the establishing of that peace it refers all its good actions, whether they be towards God or towards one’s neighbor, for the life of this City is utterly and entirely a life of fellowship..
Often compared to G.K. Chesterton and C.S. Lewis, British writer and television commentator Malcolm Muggeridge (1903-1990) is best known for having introduced Mother Teresa to the English-speaking world through his classic biography, Something Beautiful for God. A tart-tongued agnostic for most of his life, Muggeridge converted to Catholicism at 80. But he never stopped asking questions, which surely explains his enduring appeal.